It was Hugh's buoyant certainty that made my heart pang; the certainty that all the local children would read the above poster (barely legible in the photo): Hugh's poster. Come to Hugh's house if you want to come to the treasure (hunt). Don't be late. He thought they would come streaming, in joyous droves and he would be the Great Gatsby of our postal code, handing out wrapped-up treasure, glowing with the joy of giving. He didn't say this, of course, but it was there in the subtext. I couldn't bear to tell him otherwise, so I texted 'Daddy' to make a fuss of the clues. 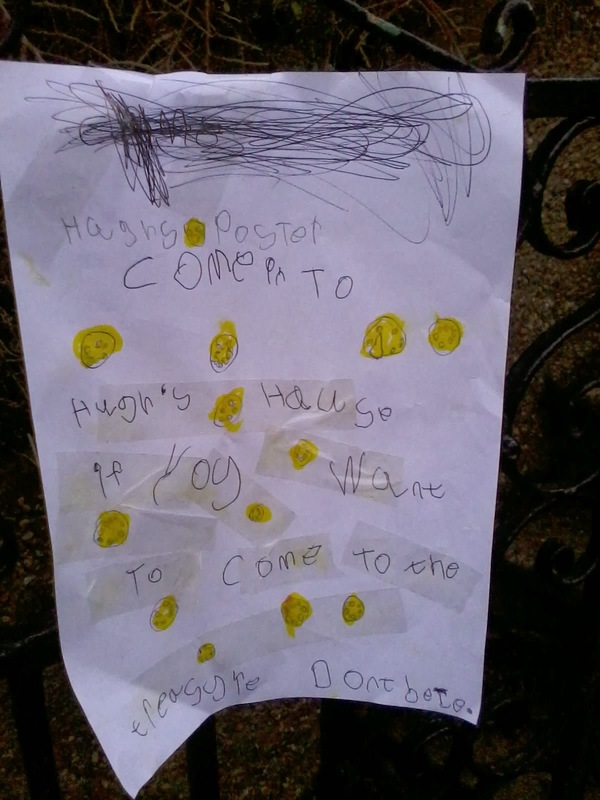 Somehow, the fact that daddy was on his way home anyway, was subsumed by the fact that Hugh's poster had called him from afar, beckoning with promise. Alchemy in itself.